In January of 2013, when I was a total newbie writer, I met a few writers through Twitter. 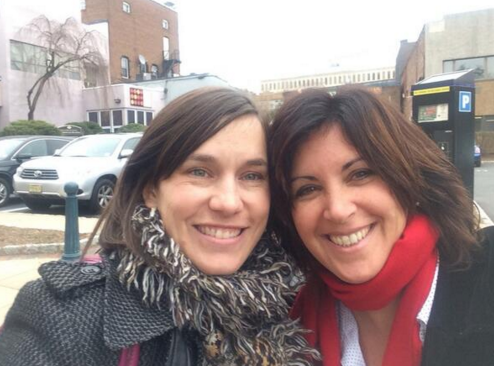 Since we lived in the same geographic area, we thought it would be nice to have a "writer's retreat." We had visions of renting a house with a fireplace, on a lake, relatively close to where we all reside... when it occurred to me. I live in a house with a fireplace, on a lake, relatively close to where we all reside. So I invited these then complete strangers (Jen Malone, Melanie Conklin, and Alison Cherry) over for the weekend. Friends: You invited a group of people you don't know to your house for the weekend? Me: I know them. From Twitter. Me: I checked them out. Friends: Did you do a background check? Through the FBI? Me: No. I googled them. Me: They seem really nice. But, I trusted my gut (after all, I met my husband online, and he turned out to be pretty awesome). So, Jen, Melanie, and Alison came over one foggy weekend in January. And it was incredible. Not only was I thrilled and humbled to be among such incredible writers, these women became my friends. At the time, Melanie was revising a manuscript. I’ll never forget how she sat on my living room floor with colorful post-it notes, piles of notebooks, and creative doodles. Her process was pure genius. That manuscript was COUNTING THYME, which was published on Tuesday. Watching a book being born is like watching a child grow up. I was there when COUNTING THYME walked across my living room floor. I celebrated when the book deal was announced. I read the first version and I read the final version. 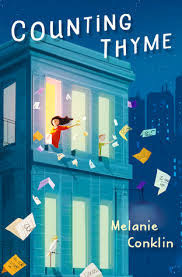 I've cheered for COUNTING THYME at all these milestones, because it has everything I love in a middle grade novel… an authentic voice and a story with a whole lot of heart. And now, COUNTING THYME is out there for all of us, so go. Go get the gift of THYME. You'll be glad you did.